Flames and the sounds of battle were coming from the direction where the Anadyomaians built their colony, and we and the five Teloi ran in where patches of the forest had been set to fire. On the way, we’ve been hailed by a small group of Anadyomaians who have been set as a watch against flanking attempts from the mysterious attackers. Moving on, the first bodies we’ve come across were those of Anadyomaians, but soon they were mixed with mail-wearing, blond and red haired warriors — in this area, the only stock of such people hailed from Yaram, the island long at cold war with Khonón. Flying above the scattered groups of fighters — well over a hundred attackers –, our wizards have spotted a group of some 30 people apart from the fight, possibly a group of Yaramite leaders. The Teloi joined the fray, while we drew closer to the group. Sure enough, the fancy armour and weaponry betrayed some of them as the warleaders, but we also spotted a group of five captives in their midst — the effective use of Fireballs or Lightning Bolts was out of the question! All this was on top of a high cliff overlooking the northern beach, and the captives were being jostled towards a narrow path leading down the cliffside onto the sands — and we saw two dragon ships in the distance, off the coast. Arriving to the isle of Immah Wel, we hide our ship in a small grotto and make for the temple complex, carrying our four barrels of salt-fermented goat wine. We decide to circumnavigate the site at a distance and approach it from the south, since we knew of several unguarded entrances on that side. As we walk along arguing about various aspects of our plan to attack **TRAGOS MEGALOS**, Melan inconspicuously rolls a d6 for random encounters… a 1! Melan smiles, rolls again… and it’s another 1! We got back to the Sea Foam Serai, rented a number of rooms for our group according to each member’s desire for privacy and state of money pouch — Ambrosius and Khasim gave extraordinarily generous tips to the servant in charge, and Ambrosius let him know he was a mercenary looking for work — and retired for the night. Soon after, however, the three of us sharing a four-bed room were woken up by a loud banging on the door, and the drunken tenants of the neigbouring room have foisted off an even more drunken… drunkard… on us, a brawny, moustachioed men clutching a hand-and-half sword even in his stupor. Apparently, he was given the fourth bed in our room but ended up in the wrong place. A brief altercation with the neighbours followed, as well as a discreet but unsuccessful shakedown attempt of the newcomer (the PC of a player who couldn’t make it to the first session). Burzasp: While everyone else is busy arguing and shouting, I helpfully prop the man up against the wall while patting him down for anything to take. Santiago (OOC): Melan, this is the WORST way you’ve ever introduced my character to the party. In the morning, we introduced ourselves to our new roommate, a warrior called Santiago di Lavellos from a distant land, who, having a chronic shortage of money, a monster hangover and nothing better to do, agreed to tag along with us on our mysterious investigation. After a generous breakfast, we talked to Skaganti, the owner of the serai, a man in gold-emroidered magenta robes and the tattoo of a grinning red sun on his brow, who received us in a side office, a place of modest decoration. As Ambrosius queried him, it turned out that Skaganti did, in fact, have a job. A friend of him — allegedly a trader of some sort — was robbed recently, and was looking for someone to recover his goods. Intrigued, we decided to wait an hour for him to show up and discuss the job, while the two spellcasters went out to do a bit of private investigation related to our main business. The negotiations were over. As described above, Khonón would give the refugees aid and transport them to the Isle of Diaphane to start their lives anew. The ships were to leave the next morning, but we weren’t in the mood to just wait patiently. Using spells of invisibility and the secret passage connecting the docks to an out-of-sight corner of the castle courtyard, Tyraxus Targ and Zaxtaros snuck out late in the afternoon to check on the party’s ship, which — as we’ve overheard in the confusion following the refugees’ appearance — was impounded for some unclear reason. They found the small ships still moored at the docks with only a solitary guard standing at the near end of the pier. Under the cover of invisibility and dusk, they snuck onboard to see whether the ship’s been tampered with in any way. A brief search turned up nothing, but they noticed how the crates and barrels of supplies we’ve already loaded aboard for the next voyage were, somehow, arranged in a more orderly way then we’ve last left them. Looks like someone must have been going over the entire ship and failed to replace everything exactly as it was. Further search finally turned up something: some green dust on the planks right in front of the door of the aft cabin. Examining it up close, Tyraxus realised it was jade dust, used to construct a Magic Mouth on board the ship. They didn’t know when the Mouth was supposed to activate or what it was supposed to say, but the two decided to play it safe and deconstruct the spell with Tyraxus’ Dispel incantation. 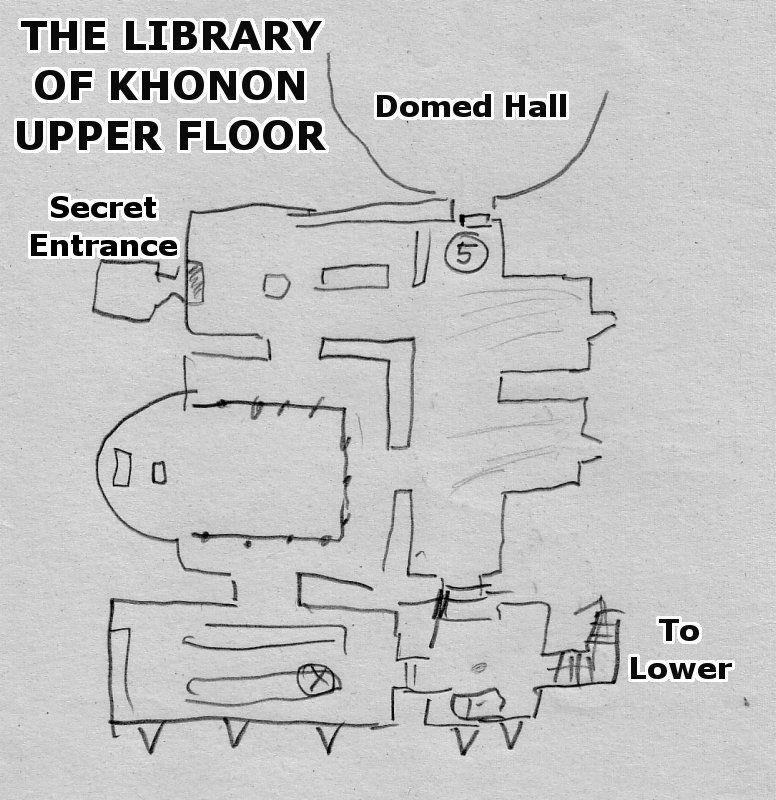 There we were, beneath the Khonón library, with 700 weary and confused refugees. Luckily, there was a domed hall and some other large rooms in the immediate area, approachable through only two chokepoints. We told the refugees to sit down here and wait until we prepare their emergence into the city, took a few of the Teloi with us, and went exploring. Sure, we’re going to help them, but we originally entered the library to acquire information about the mysterious Morreion — a bit of searching before the grand reveal sure wouldn’t hurt. 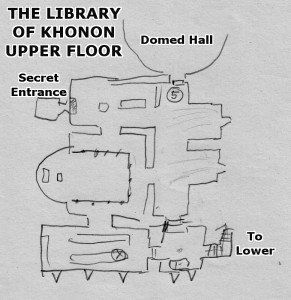 Using some discretion and a few Detect Magic spells, we quickly went through the library, a not too large, two-storey complex. Didn’t find any of the forbidden books from the from the index the backstabbing Megamarkhos gave us, but did find a few things of interest. A sort of shrine stood in front of a great statue, which the Teloi recognized with a gasp, for it was the image of Mesomakhos himself! In front of it was a pedestal with a gorgeous sceptre, but protected by some sort of crystals emitting a field of light, and the party quickly and forcefully persuaded Zaxtaros to forget even going near it. We also found the statue of a hooded, humpbacked figure holding a seven-tubed musical instrument, but we figured it might be a warning device and left it well alone. A hidden wall compartment was discovered behind a bookshelf thanks to the magic radiation issuing from within — we found a box containing a transparent, soaplike block with a few small articles inside it. Deciding the block was probably protecting its contents and might be dangerous, we put it in our packs and moved on. Soon enough, we found a seemingly unfinished room in the library with empty, dusty shelves — except for one. Moving it aside revealed a full-body fresco of Mesomakhos, located — obviously — on a removable wall panel which was hiding a staircase leading down and some footprints in the dust. Surely, this must be the forbidden library! Someone is coming to. His consciousness returns, accompanied by a pressure in the skull, ringing ears, and a lack of memories. He opens his eyes. Six men are sitting around a low table, unrecognizant. Five are confused. One is dead, blood seeping from his nose, mouth and ears, two rows of gemstone teeth glinting from his opened mouth. Each of them is holding a strange, three-pronged tuning fork made of some iridescent material. They quickly introduce themselves while looking around the luxurious room. They’re Muzafar, a sinister-looking man with a long beard and a thick book of spells, Vifranavaz, a young man with golden threads in his beard and an old carpet with the patterns of birds next to him — a master of illusions — Khasim Rabad, a thief, Ambrosius, a stocky and muscular swordsman, and Burzasp Sherfiruz, a good-looking man whose metal armour occasionally slips from under his cloak. Nobody remembers how they got here, or in fact anything other than their names. In fact, they’re even carrying some items on their persons which they do not recall owning, such as various coloured vials in a lead box, a peculiar hollow dagger made of green glass, a green cloak with the image of a white hand, a turban with some unrecognised writing on it, and a scimitar engraved with the name of someone named Talhuris Khan.